Berkshire hogs originated in the shire of Berks in England. They were discovered 300 years ago by Oliver Cromwell and his army who impressed with the large size of the hogs and the great flavor of their meat. After the war, news of the Berkshire hogs spread as veterans returned home and told the tale. The Berkshire hogs became popular with the wealthy farming class. And even the Royal Family kept a herd at Windsor Castle. Berkshires are a large hog that can weigh as much as 1,000 pounds when full grown. The bloodline is almost entirely pure other than a cross with Chinese and Siamese bloodlines that was done to refine the breed. This cross accounts for the coloring of the modern Berkshire as well as the large efficient quality of the animal. For the last 200 years the Berkshire bloodline has remained pure with records kept to maintain standards. Berkshire hogs were brought to America in 1823. They were very popular and were used to improve the existing hog stock through breeding with common stock. One or more of the main American breeds owes much of its success to the infusion of Berkshire blood into its bloodline. Having been used to improve the common stock, many hog farmers felt it was worth maintaining the pure Berkshire line for posterity. That way the bloodline could continue to be used to improve other hog stock without being assimilated into it. In 1875 these farmers formed the American Berkshires Association for the purpose of protecting the bloodline. The task was made easier by the creation of the first ever swine registry to track the bloodline. The first hog in the recorded blood line was a boar hog belonging to Queen Victoria named Ace of Spades. The blood line was kept pure by importing Berkshire hogs from England. Only these hogs from Berkshire or those that could be directly traced back to imported animals were included in the swine registry. This practice continues today although there is a far larger breeding pool domestically. Berkshire hogs have improved swine production in the United States and throughout Europe. Over the past 100 years there influence is especially noticeable and easy to trace because of the dutiful records of the Berkshire Breed Association. Modern animals are breed for ideal meat quality, fast growth, and reproductive efficiency. These are traits that not only make the hogs taste better, but make then cheaper and easier to raise and breed. The Berkshire Breed is the biggest winner of national and international competitions. And this is added to the fact that much of its competition owes its own success to the proportion of Berkshires blood that it carries. 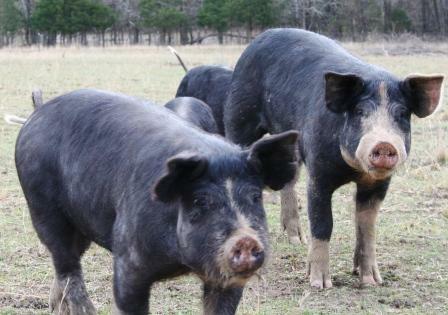 Berkshire is clearly the most influential breed in the world and its introduction and widespread use in America and other countries has vastly improved all swine stock. It is certainly important to maintain the pure Berkshire Bloodline to retain the intrinsic qualities of this superior breed. Given the dedication of the Berkshire Breeders Association, there is little doubt that the breed with continue for many years to come.